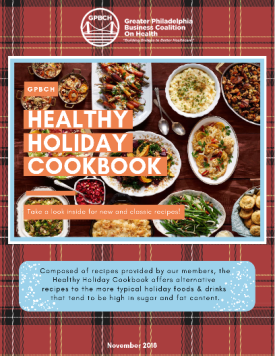 With the holiday season quickly approaching, it is our pleasure to share with you the 2018 GPBCH Healthy Holiday Cookbook! This document is composed of recipes contributed by our members with the purpose of providing healthier alternative options to the more typical holiday recipes. You are more than welcome to share the Cookbook with colleagues, employees, family, and friends! We would like to thank everyone who submitted their favorite recipes to the Healthy Holiday Cookbook and hope that you are able to discover new favorites of your own. We would like to wish you a happy and healthy holiday season from Neil, Jill, Eric, Marty, and Ray!